How to create a sustainable relationship? It can be purchased from various online book stores. Prices starting from 47 USD. 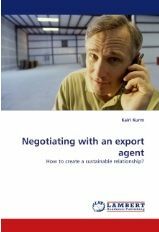 How to create a sustainable relationship with an export agent, when in fact the interests of two parties are so different from each other? There is always some sort of a conflict of interests between manufacturers and their agents. For the agent it seems the products are too expensive and hence difficult to sell, whereas the producer feels the agent makes too much profit on the sale of their products. An agent faces a double risk when it enters a relationship with a supplier. If sales fail to materialize in spite of big efforts, the agent might be dropped for non-performance. On the other hand, if sales materialize, again the agent risks being dropped as the supplier gains control of the agent’s market. The following book will cover the whole process of negotiation from determining what both parties can expect from each other until signing a contract. Psychological and cultural aspects are also discussed. The following work will help managers, sales directors and lawyers conclude agency deals. It is especially useful for companies that can not afford hiring new people for market expansion or are looking for new ways to increase sales. Kairi Kurm, MSc: Studied business at Tallinn University of Technology, Estonian Business School and IESEG School of Management (France). Currently an entrepreneur helping companies in business networking. Also engaged in marketing projects with her company Brilliant Fixer Ltd. Previous work experience mainly in journalism and export promotion. Statistics Estonia presents today, on 30 July, the publication “Eesti statistika aastaraamat. 2010. Statistical Yearbook of Estonia” which reflects in figures the life of Estonia in the first decade of the 21st century. At the presentation, Statistics Estonia looks back on the year 2009 and seeks an answer to the question “Which is the situation in the social and economic life in 2010?” Is there anything positive besides negative news? Economic recession appeared to be unexpectedly sharp in 2009, therefore a lot of enterprises had to adapt quickly and decisively to new circumstances. Altogether the economy slipped back to its mid-decade level. “Economic recession has its pluses,” admitted principal analyst Aavo Heinlo, who gives an overview at the presentation of how enterprises have coped. “It worked as natural selection in the business sector: eliminated the weak, stopped the borrowing boom and spending and forced the survivors to be effective and introduce organisational as well as marketing innovations,” he said. Mr. Heinlo describes that at the beginning of 2010 the downward curves gave way to signs of recovery as exports and industrial production started to grow. “Innovation, fulfilment of the euro criteria and a hope for an improvement in the global economic situation are like a balm for Estonia’s economy,” points out Mr. Heinlo. At the presentation, principal analyst Siim Krusell outlines the social and demographic trends and states that the year 2009 was a complicated one for a lot of households and a tough task for the state and local governments. “A lot of problems which emerged at the end of 2008 or in 2009 have aggravated this year,” he noted. As an example he marks that unemployment was on a record high level at the beginning of 2010. “In the 1st quarter, every fifth economically active working-age person was seeking a job and the labour market indicators look worse now than after the crisis of the end of 1990s,” he mentioned. Mr. Krusell admits that the high level of unemployment is currently one of the most crucial problems which will have short- and long-term impacts on a lot of spheres in life. Whether unemployment is growing, has stabilised or even decreased a bit — this will become clear in mid-August when Statistics Estonia is going to release the unemployment indicators for the 2nd quarter. According to Mr. Krusell, the fact that people have evaluated their economic coping in 2009 as worse than a year before is a proof of the gravity of situation. In 2008 people coping with great difficulties accounted for 8% and people coping with some difficulties comprised 32% of the population, but in 2009 the respective indicators were 15% and 36%. According to Statistics Estonia, in June 2010 compared to June of the previous year, the retail sales of goods of retail trade enterprises decreased 7% at constant prices. Retail sales have been declining during the whole year in comparison with the respective month of the previous year. In January retail sales decreased 12%, in February 11%, in March and April 9% and in May 5% compared to the respective months a year ago. In June, the retail sales of goods of retail trade enterprises were 4.8 billion kroons (309 million euros). Compared to June 2009, the retail sales of goods decreased in the majority of economic activities except in the stores specialised in the retail sales of food, beverages and tobacco, in the stores selling pharmaceutical goods and cosmetics and in the stores of second-hand goods. The low reference base in 2009 contributed to the sales growth of the stores specialised in the retail sales of food, beverages and tobacco. However, the sales increase of the stores in this economic activity does not significantly influence the retail sales of goods, because the share of this economic activity is very small — 3% in June of this year. In June, the decrease in the retail sales of goods was most influenced by the stores selling manufactured goods, where the retail sales decreased by 8% compared to June 2009. Retail sales decreased the most i.e. 14% in the stores selling household goods and appliances, hardware and building materials. Retail sales in grocery stores have been rather stable during the recent months. In June compared to June of the previous year, the retail sales of these stores decreased 3%. Compared to the previous month, the retail sales of goods in retail trade enterprises increased 2% at constant prices. But according to the seasonally and working-day adjusted data, retail sales remained at the same level compared to the previous month. In June, the revenues from sales of retail trade enterprises were 5.9 billion kroons (380 million euros), of which retail sales of goods accounted for 81%. Compared to June of the previous year, the revenues from sales stayed at the same level at current prices. But compared to the previous month, this indicator increased one percent. According to Statistics Estonia, in June 2010 the production of industrial enterprises grew 21% compared to June of the previous year. The production of manufacturing also increased 21% compared to June of the previous year. The 2% growth reported in January 2010 was followed by a rapid increase — in March enterprises gave 11%, and in April and May 18% more production than in the corresponding months of 2009. In June, export sales of the manufacturing production increased significantly (42%). Demand on the domestic market was still insufficient and the domestic sales fell 6% compared to June of the previous year. In June, two thirds of the whole production of manufacturing was sold on the external market. In June, production exceeded the previous year’s level in most branches of industry. Growth in the production of manufacturing was most influenced by the branches holding bigger shares — manufacturing of electronic products where the production increased by more than one and a half times, and manufacturing of wood where the growth was 26%. With respect to the branches of manufacturing holding smaller shares, production increased considerably in the manufacturing of motor vehicles, metals and pharmaceuticals, mainly due to the increase in exports. The rapid growth in production was partly also influenced by the low reference base in 2009; this effect will last until the end of 2010. The production of food, beverages, leather, metal products and other transport equipment, and the production in the repair and installation of machinery and equipment decreased. In June 2010 compared to May, the seasonally adjusted industrial production increased 3%, the production of manufacturing grew 2%. In June 2010 compared to June 2009, the production of electricity increased 31% and the production of heat — 7%. The increase in energy production was mainly caused by a growing demand for energy induced by more active manufacturing as well as by the growth in the exports of electricity. Eesti Pank has decided to commission 600,000 euro coin starter kits to familiarise the people of Estonia with the new currency prior to the changeover to the euro. The kit consists of 42 coins amounting to 12.79 euro. The starter kits will be sold for 200 kroons per kit. The starter kits contain all the denominations of the Estonian euro coins to be launched. Thus, each kit includes seven 1 cent coins, six 2, 5, 10 and 20 cent coins, five 50 cent coins, four € 1 coins and two € 2 coins. The sale of the starter kits starts on 1 December. Since every household should get a kit, one person can buy up to five kits at a time. The euro coin starter kits will be sold at bank offices. If possible, the network of the sales channels will be expanded and notice thereof will be given before December. The coins in starter kits will become valid as from 1 January 2011, when euro becomes legal tender in Estonia. Prior to that date, the Estonian euro coins are not valid as a means of payment in any country. The coins will be produced by Mint of Finland. The production of the starter kith is co-funded by the European Commission. Estonia’s new euro coins are displayed at the Eesti Pank Museum (Estonia pst 13, Tallinn). The museum is open from 12-17 from Wednesday to Friday and from 11-16 on Saturdays. Entrance to the museum is free of charge. At its session today, the Government of the Republic approved draft sale and purchase agreements for Estonia’s unused pollution quota AAUs (Assigned Amount Units), which are being entered into with the Kingdom of Spain and the Japanese bank Sumitomo Mitsui Banking Corporation (SMBC). With the entry into force of these transactions the government will have sold AAUs to the value of one billion kroons in 2010, which is twice as much as planned in the annual budget. The sale of the AAUs is taking place as part of the green investment scheme, which requires the revenue raised to be reinvested in environmentally friendly projects designed to reduce CO2 and greenhouse gas emissions. The government’s decision to approve the transactions brought to an end almost a year of preparatory negotiations. Based on the agreement with Spain, the revenue raised from the transaction will be used to develop wind energy and environmentally friendly public transport. 23 million euros (ca 359 million kroons) of AAU sales revenue will be invested in wind energy. This investment will allow production capacity of around 25–30 MW of wind power to be generated in Estonia in addition to the capacity financed through tariff support. The support will be issued by the Environmental Investment Centre foundation on the basis of a regulation of the Minister of Economic Affairs and Communications. The application round will be launched in August and will be open to new projects which do not receive tariff support. The investment will reduce the CO2 emissions from the production of electricity in Estonia by 1.5 million tonnes over the next 20 years. As part of the investment scheme for the development of public transport, the state will be spending 21 million euros (ca 328 million kroons) on economical new buses for public service. The Road Administration will be conducting a public procurement in order to implement the support scheme. The buses purchased as a result of the procurement will go into use on regional and outlying urban routes. With the available financial resources it is estimated that ca 110 buses could be purchased, coming into use in 2011. The sale and purchase agreement being entered into with Spain is valued at 688.5 million kroons. The government has also authorised the Minister of the Environment to enter into an agreement to sell 0.5 million AAUs to the Japanese bank Sumitomo Mitsui Banking Corporation (SMBC). The revenue raised from the transaction will be invested in measures designed to boost the energy efficiency of government department buildings. A total of 11 buildings will be renovated, three of which are used by the Ministry of Education and Research, six by the Ministry of the Interior and two by the Ministry of Social Affairs. Estonia has already entered into two sale and purchase agreements with Austria for the transfer of 2.9 million AAUs. According to Statistics Estonia, in May exports of goods from Estonia amounted to 11.3 billion kroons (721 million euros) and imports to Estonia to 12.5 billion kroons (800 million euros) at current prices. Compared to May 2009, exports increased in the dispatches of all commodity sections, especially in the dispatches of metals and products thereof. In May exports grew by 38% or 3.1 billion kroons (199 million euros) and imports by 47% or 4 billion kroons (256 million euros) compared to May 2009. The trade deficit amounted to 1.2 billion kroons (79 million euros), which was nearly four times more than in May of the previous year. In May, the biggest share in Estonia’s exports was held by the commodities of machinery and equipment (19% of Estonia’s total exports) and mineral products (18%). Compared to May of the previous year, the biggest increase, i.e. 0.7 billion kroons (43 million euros), was reported in the exports of metals and products thereof. Metals and products thereof were mainly exported to Finland and Turkey. Dispatches of mineral products (incl. motor spirits, fuel oils and electrical energy) increased by 42%. In May the biggest share in Estonia’s imports was held by mineral products (23% of Estonia’s total imports) and machinery and equipment (20%). The turnover of imports increased among all main commodity sections compared to May of the previous year. The biggest increase was announced in the arrivals of mineral products and machinery and equipment. The main countries of destination for Estonia were Finland (17% of Estonia’s total exports), Sweden (13%) and Latvia (9%). Electrical machinery, furniture and wood and articles of wood accounted for the biggest share of exports to Finland; electrical machinery, wood and articles of wood — to Sweden; and fuels and vehicles and parts thereof — to Latvia. Compared to May of the previous year, exports to the USA and Sweden increased the most. The main countries from where goods were imported to Estonia were Finland (15% of Estonia’s total imports), Germany and Lithuania (11% from both). Fuels accounted for the biggest share of imports from Finland and Lithuania, mechanical machinery and vehicles and accessories thereof — from Germany. The biggest increase was announced in the imports from Finland, Lithuania and Germany. According to the data of Eurostat, the turnover of exports of the European Union (EU) countries increased by 22% compared to May of the previous year. In May compared to April, exports from Estonia increased by 7%, and imports to Estonia by 14%.